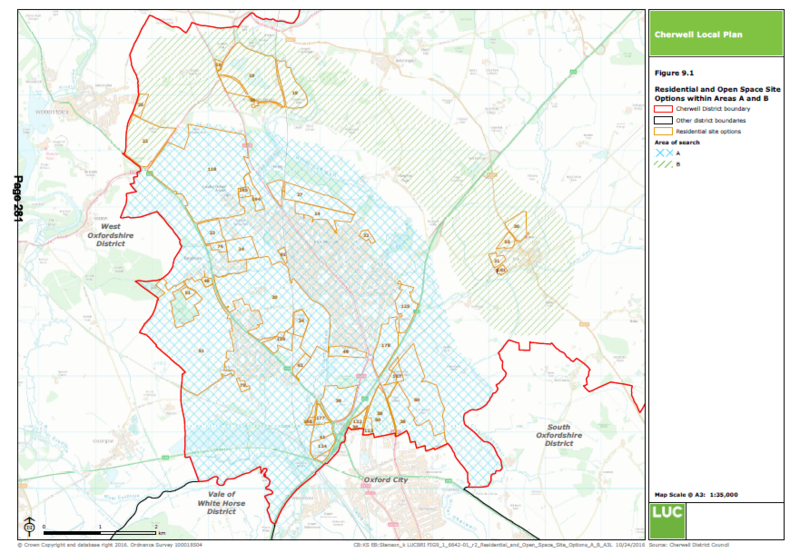 We now have first sight of the options that Cherwell District Council will be considering to find sites for 4400 extra houses to help meet Oxford’s alleged need (as assessed by the SHMA). They intend to publish these soon as consultation documents. Cherwell’s Executive will be asked to approve the relevant documents (over a thousand pages of them) in a 10 minute slot at its meeting on Monday (7th November). No Kidlington councillors are members of Cherwell’s Executive even though all the shortlisted sites are around Kidlington. The 4400 figure for Cherwell (out of a total of about 15000 extra for Oxfordshire) was arrived at by calculating that they could be built in three broad locations: land immediately north of Oxford towards the A34 (2200 houses), land between the A34 and Kidlington (550 houses) and land around Begbroke (1650 houses). However, this initial calculation was just an exercise. Cherwell now wants to consult on where the houses should actually be located. Kidlington is identified as one of several ‘areas of search’ across the whole District. However the Kidlington area (Option A) is singled out for “detailed assessment”, together with an arc of land described as “land north and east of Kidlington” which runs from Islip to Woodstock (Option B). Almost all of the land lies within the Green Belt. The document lists about 30 possible development sites in Areas A and a further 8 in Area B. They are all over 2 hectares (5 acres) and are each considered capable of accommodating at least 100 houses. They were proposed by developers early this year following a ‘call for sites’ by the Council. The Council has even ranked the 38 sites in terms of suitability from a transport perspective and have been undertaking ‘sustainability analysis’. It is clear that their ideas are well advanced. 4400 houses means about 11000 more people – almost as many as live in Kidlington at present. There are huge implications for transport, infrastructure and the environment. We would never be in this position if Cherwell had taken a stronger and more realistic line over the Strategic Economic Plan and the Strategic Housing Market Assessment in the last three years ago and stuck to it. Now Cherwell appears to be happy to build in the Green Belt despite the Government’s commitment in its manifesto that “we will protect the Green Belt” (This phrase appears no less than three times in the manifesto). There is not much we can do at the moment. 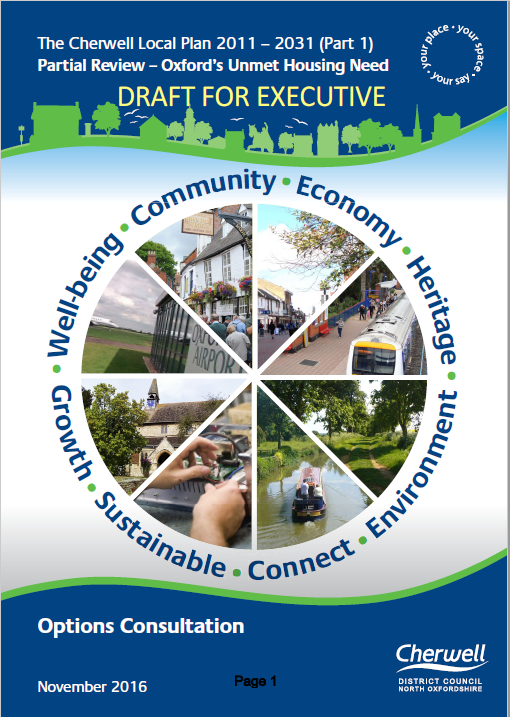 However Cherwell will shortly launch its consultation and we will be able to make representations on their proposals. They will include a question about whether 4400 houses is a reasonable number. However, we are not optimistic that they will take much notice of our responses on that. We will be in touch again with more information and suggestions about how to respond to the consultation.